Recently, I’ve been trying to cut back here or there on my carbs. Due to my mother’s diabetes and my obesity (and therefore being in the danger zone), I figured it was a good move to make. 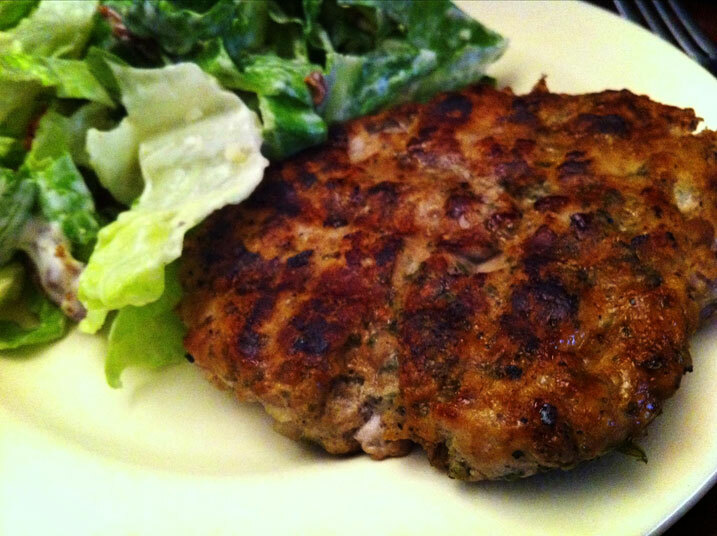 So I’ve been browsing the diabetes-friendly recipes online and found this really interesting one: Chicken Caesar Burger at Taste of Home. The idea intrigued me but I didn’t want the big white hamburger bun. I had bought some whole wheat English muffins, but I got to re-thinking that idea. I thought, Why do I need a bun?? So I considered deconstructing the recipe ever so slightly and presenting the patty next to a Caesar salad. So, that’s what I did and boy, am I full! They were very filling and very satisfying. I was full after one patty and my salad. I only made a slight change to the patty recipe: I didn’t add the second bit of parmesan cheese to the top of the patty and I didn’t have fresh garlic, so I used a teaspoon of garlic powder. The recipe itself was extremely easy to follow. Everything for the burger goes into one bowl to be mixed, while the salad stuff is mixed in another. Grill these up on your indoor grill and within 6-8 minutes, they’re done (just make sure that the internal temp is at least 160F). I think the whole process took no more than 15 minutes to throw it together and cook. While the patties cook, make the salad. And the patties are very large, being 1/4 pound a piece. The salad was about 2 cups of romaine lettuce, 3 slices of ready-made bacon (chopped and quickly cooked up in a non-stick pan), the parmesan I didn’t put on the burgers and some Renee’s fat free Caesar salad dressing. Delicious! Even hubby agrees! I’d recommend this to anyone. This entry was posted in altered recipes, Brunch, Carb-friendly foods, dinner, grill, Lunch, nutritional values, quick-and-easy and tagged bacon, caesar salad dressing, chicken, garlic, ground chicken, lemon juice, lettuce, parmesan, parsley, romaine lettuce. Bookmark the permalink.